When you have special friends and they do something mean to you, how do you react? Do you react kindly and calmly or do you get angry and yell? Well you parents sometimes get really mad at your kids because they did something horrible. Right? So, you yell at them [or he/she]. Why can't you just take deep breaths and talk it through? You scream and yell because you can't control your anger. Or you just yell because you feel it's right. Take this for example me and my sister Hannah are playing ball in the house when mom told us not too, then mom sees us and yells because she's mad. Same with most of you. Take a deep breath and talk the problem through instead of going the wrong way that JESUS WOULD NOT want you to take. So what do you think of Abby's advice? Let her know in the comments. This is Abby. Probably because we think it's fun.. Seems like maybe you and your mom have been hanging out in my house and wanted me to hear this. Well said, Abby! This is Abby. Thank you! I think all of us probably need to take a deep breath sometimes, don't you, Abby? Great post, young lady. I love the picture of you looking pensive. This is Abby. Thanks and yes i do have to take deep breaths sometimes. Thanks for this reminder, Abby. I think we are less likely to "lose it" if we take time to start the day right by reading God's Word and praying for our family and our day. We need His help! No one is perfect. We are all going to mess up and get mad sometimes. The good news is that God gives us a 2nd change. We can ask Him to forgive us, apologize to our family, and start fresh. This is Abby and i totally agree with you. Abby, such a great post. I appreciate your advice. I'm going to try very hard to remember to talk it out and take deep breaths. Hope you and Hannah are having a good summer! Yes me and Hannah are having a great summer and your welcome for the advice. Do you have any advice on blogging? Abby, it is AMAZING how God works! I so needed to read this post and use your advice with my kiddos. It has been on my heart, the last couple weeks have been rough. I am going to remember your advice daily this week to breathe and talk! Thank you for reading my post and thanks for taking my advice on dealing with your kiddos! I love your blog post. 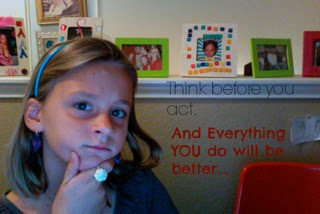 You are so wise and talented (just like your mama!). I'm not really a yeller, but I often get too sarcastic when I am angry. Thanks for sharing your words here. You are totally welcome! I am a yeller at my sister because she annoys me and I don't handle problems very well. I also will get sarcastic sometimes as well. It's good advice, Abby. Recently a ten year old boy did something really mean to me (he stole from me and then lied to his Mom...3 times) and instead of getting angry, I told him to go away for a while; I was too upset to talk. Maybe that wasn't nice but it was certainly nicer than being angry. Thanks for reading my blog post. It turns out some of my friends accused another friend of mine for stealing a tiny toy skateboard. I didn't get mad or frustrated I just talked it through like being the judge in court calling up witnesses for the crime even if there was one. Abby, thanks for the other side's perspective. It is not fun to be yelled at. I don't do a good job remembering that. I do need to be more like Jesus. Thank you for reminding me, and also forgiving your mom when she does yell; just like Jesus forgave her. I really agree about everything in your post. I do forgive my mom when she yells but, sometimes not right then. Jesus does want us to think about our choices before we do them. Great advice!! :) We all need to take a step back and a deep breath before we react. Abby: I have a 10 and a half year old daughter and she has been wanting to post on my blog. Thank you for being brave and stepping out. I will let your mom know if my daughter decides to post. It will probably be something to do with wild cats though, because she loves them. P.S. Her name is Caroline. Welcome and I would love to read your daughter's post when it's out.